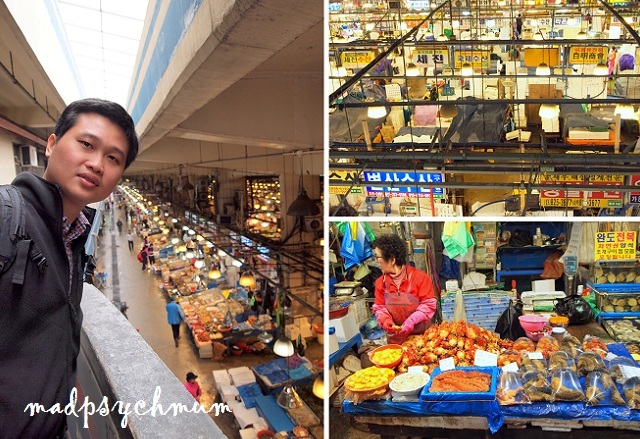 The only request the hubby made for this trip was to visit Noryangjin Fisheries Wholesale Market, the seafood haven of Seoul! To get there, take the subway from Chungmuro Station (Line 4) to Seoul Station and transfer to Line 1. Alight at Noryangjin Station (Exit 1) and walk across the overhead bridge to the market. You would know if you had arrived at the right place because the minute you alight from the train, you would immediately get a whiff of fish in the air! Can't miss it! Rows and rows of seafood stalls greeted us as we walked down the stairs into the Fish Market. The hubby was literally in 7th heaven! 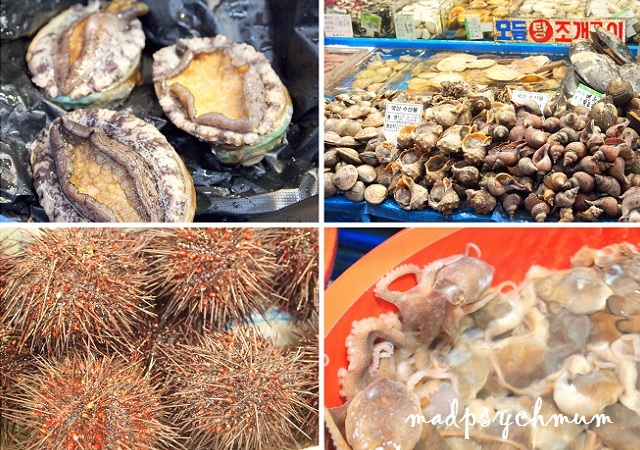 After browsing through the many stalls with different hawkers promoting their wares, we eventually decided on the stall with the biggest sea urchins and a very friendly Chinese lady who was able to communicate with us in Mandarin. We decided to get the above mentioned seafood as they were unique and so much cheaper than Singapore. 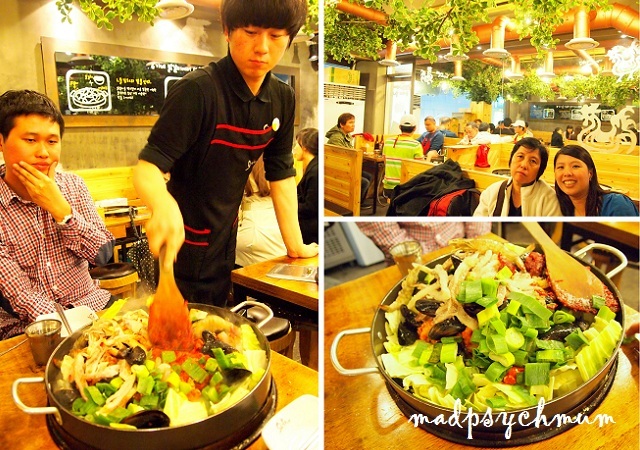 After paying for our seafood of choice, we were brought to a Korean restaurant where they could be cooked in the way we liked them (e.g. steamed, fried, etc). The restaurant charges for the cooking of each dish but does not charge for seafood that is served raw. We also tried the escargot, which the sister absolutely disliked while the hubby thought it was pretty chewy and tough. My mum and I refused to try them because they looked really gross! 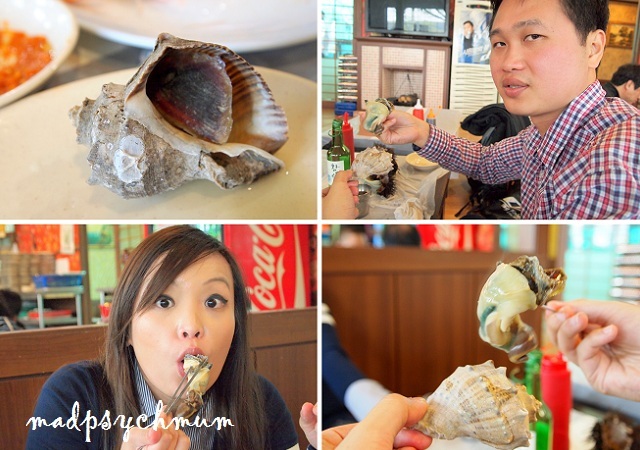 But the most disgusting dish had to be the live octopus that were eaten sashimi style (i.e. raw)! When we finally have had our fill, we proceeded on to walk to 63 Building located just 10 minutes away from the market. 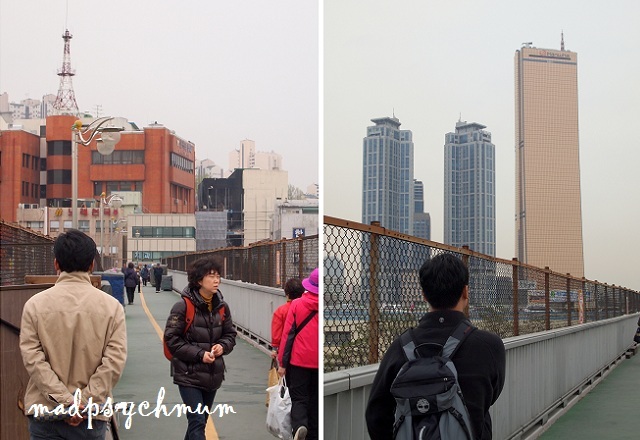 However, as we were walking, we realised that there was a large highway in between the market and the 3rd tallest building in Korea and it would take more than just walking to get there! To make matters worse, it started to drizzle and the chilly winds started to blow and we were freezing! We arrived safely by the grace of God at 63 Building, which was a commercial building that also houses an IMAX Theatre, Aquarium and Wax Museum. There was also an observatory located on the 60th floor known as SkyArt as it is the highest art gallery in the world (an adult ticket costs 12,000 won). We didn't have time to visit them as the family was excited to proceed to our next destination. 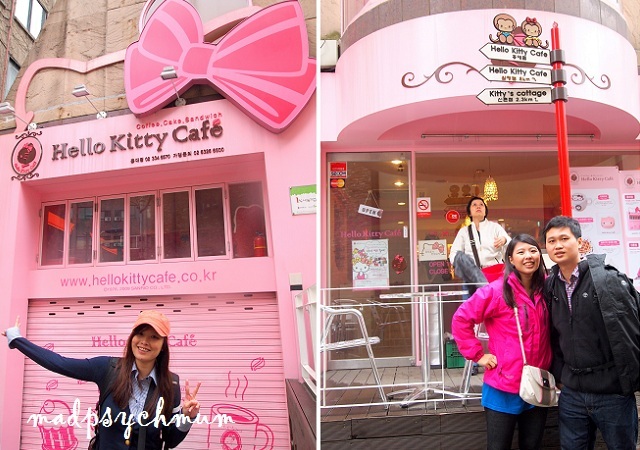 After exploring the church on our own (and trying hard not to disturb anyone along the way), we took a cab to the famous Hello Kitty Café (358-112 Seogyo) that I had heard so much about. Decorated with everything Hello Kitty! 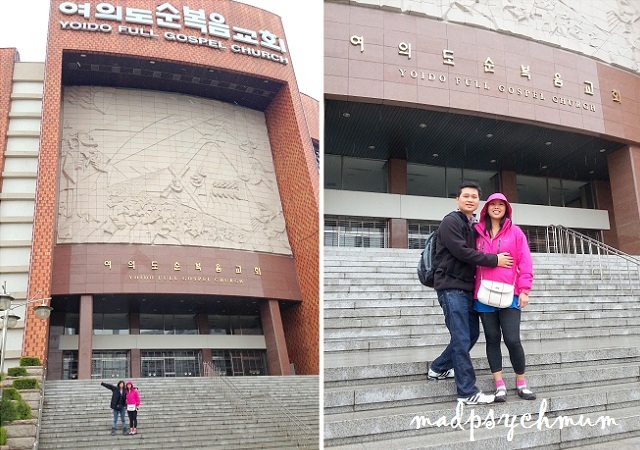 After that we did some shopping along the streets of Seogyo before travelling back to Dongdaemun for more shopping! To get there, walk for about 10 minutes to Hongik University Station (Line 2) and ride the subway to Dongdaemun Stadium Station and transfer to Line 4 to Dongdaemun Station. We didn't shop at Shinchon Ladies Street as it was raining but if you would like to visit the shopping district, you may alight at Shinchon Station, which is just 1 stop away from Hongik University Station. After walking and shopping non-stop for the rest of the afternoon, we were so tired out we decided to stop by a Chicken Galbi restaurant for dinner to rest our feet. Although it wasn't easy to order initially as the staff could not understand what we were saying but thankfully one of the staff understood a little bit of English so we eventually managed to convey our order to them. All of the seafood, chicken and vegetables were mixed into one pot where all of us were supposed to share.